BOSTON, MA (US), November 2018 — Epigenetic therapies — targeting enzymes that alter what genes are turned on or off in a cell — are of growing interest in the cancer field as a way of making a cancer less aggressive or less malignant. Researchers at Boston Children's Hospital now report that at least one epigenetic therapy that initially looked promising for lung cancer actually has the opposite effect, boosting cancer stem cells that are believed to drive tumors. They also identify a strategy that reduces these cells, curbing lung cancer in mice. The findings were published online recently in Nature Communications. Cancer stem cells have been identified in blood cancers and a variety of solid tumors. They make up a tiny fraction of tumor cells, but can regenerate a cancer on their own. Carla Kim, Ph.D., and colleagues in Boston Children's Hospital's Stem Cell Research program have shown that cancer stem cells play a role in adenocarcinoma, the most common type of lung cancer. When they transplanted cancer stem cells from a diseased mouse, previously healthy mice developed lung cancer. The new study, led by lab member Samuel Rowbotham, Ph.D., looked at an epigenetic therapy that inhibits the enzyme G9a, a type of histone methyltransferase. G9a had been thought to be cancer-promoting, and some studies have suggested that inhibiting G9a is an effective strategy in certain cancers, including adenocarcinoma. Drs. Rowbotham and Kim now call this into question. "People had looked at cell lines from lung tumors and found that they are sensitive to drugs inhibiting G9a," said Dr. Rowbotham, first author on the paper. "In general tumor cell populations, these drugs would slow down growth or even kill the cells. But we found that these drugs were also making the surviving tumor cells more stem-like. We predicted that this would advance disease progression, and this is what we saw." Dr. Kim believes this down side to G9a hadn't been noticed because prior studies only looked at cell lines, and because cancer stem cells are hard to detect. "Earlier studies couldn't see that cancer stem cells were still around, and there's more of them when you treat with these drugs," she said. "Because they're such a small fraction of the tumor, anything that affects them can easily be missed." But Drs. Rowbotham, Kim and colleagues also found potentially better enzymes to target: histone demethylases. Their action is chemically opposite to that of G9a, stripping off a methyl group from histone where G9a adds one. When Dr. Rowbotham knocked down the gene for demethylase enzymes, and added a drug that prevents them from working, he was able to make the cells look less like cancer stem cells in a dish and behave less like cancer stem cells in live mice. When he gave demethylase inhibitors to mice with established lung tumors, cancer progression was slowed and the animals survived longer than untreated mice. Although a cancer stem cell hasn't been found in human adenocarcinoma, Dr. Kim believes the findings are worth pursuing further. She notes a related line of evidence — a 2017 study that found that demethylase inhibitors were effective in killing chemotherapy-resistant cells from patient tumors. "Even if we can't pinpoint cancer stem cells in human patients, Sam's work shows you can start by studying a cancer stem cell in a mouse model and identify targets that could be clinically important," she said. "It shows the importance of finding the right molecule the cancer is sensitive to. In adenocarcinoma, a demethylase inhibitor is likelier to be more useful than methyltransferase inhibitor." Treating adenocarcinoma with G9a histone methyltransferase inhibitors leads to an increase in tumor cells with stem-like properties. 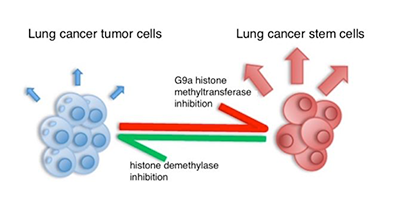 In contrast, inhibiting histone demethylase prevents tumor growth. Image courtesy of Samuel Rowbotham/Boston Children’s Hospital.